LYNN JEFFRIES designs puppets, sets and costumes. She is a founding member of Cornerstone Theater Company, which recently celebrated its thirtieth year of producing original plays with, for and about communities in Los Angeles and beyond. Since 2003, she has collaborated on numerous spectacles with satirical puppeteer/performance artist Paul Zaloom. Their latest, White Like Me: a Honky Dory Puppet Show, has toured to eight countries and throughout the United States. 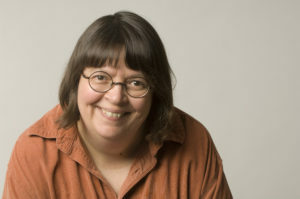 Lynn has designed puppets, sets or costumes at several regional theaters, including Oregon Shakespeare Festival, Arena Stage, The Guthrie, South Coast Repertory and Long Wharf. For several years, she performed original shadow puppet pieces in bars and nightclubs with the neo-Vaudevillian band, The Ditty Bops. Her awards include an LA Weekly Award, an Ovation Honor, and a Los Angeles Drama Critics Circle Award for puppet design; Backstage West Garland Awards for set design and for costume design; and a Drama-Logue Award for scenic design. Lynn is also honored to be the only set designer whose work has been featured on the cover of the Norcatur, Kansas, Grain Company calendar.